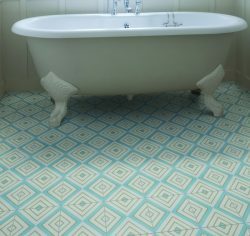 Our electric range of encaustic tiles is a great way of introducing colour and pattern into the bathroom. 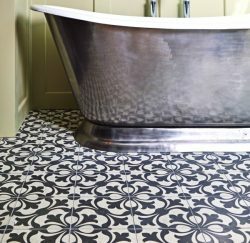 Made using the ‘encaustic’ technique, coloured cement is inlaid into the body of the tile, so that the design and colour remain, even as the tile wears. They have enjoyed a rise in popularity in recent years, but their fundamental qualities remain the same; hard wearing tiles combined with impeccable designs. 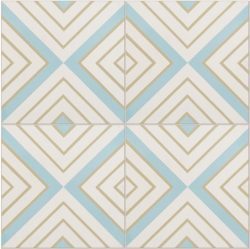 Our Ashley tiles really pack a punch in the style-stakes. Their bold contrasting colour palette is offset with an intricate feminine pattern. 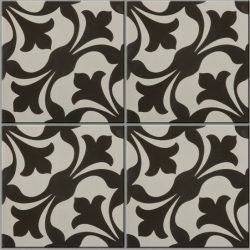 Elaborate floral swirls adorn the tiles and make for a striking floor and wall. To accentuate the design further, pair Ashley with the charcoal plain field tiles to make a striking border. 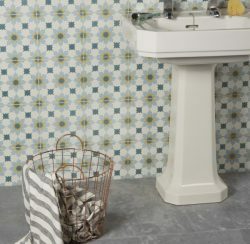 Darcy tiles add a light feminine touch with a hint of retro, thanks to their subtle colours and rhythmic design. The pale blue and off-white diamond pattern is made complete by the delicate gold borders. 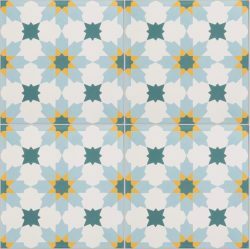 Tangier is a playful design that consists of a white and pale-blue colour palette, with teal and yellow stars symmetrically placed across the tiles. The design is extremely versatile and is perfectly suited to a spa-like bathroom, a botanical sun room or as a pop of colour for a kitchen splash-back.